Arthur Leung holds an MFA in creative writing (with distinction) from the University of Hong Kong. His poems have been widely published in print magazines, anthologies and online journals. 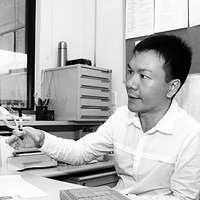 Leung serves as an Associate Editor for Cha and is on the international editorial board of Yuan Yang. He was a winner of the 2008 Edwin Morgan International Poetry Competition. In 2009, Leung was commended by the Home Affairs Bureau of the Hong Kong SAR government for his outstanding artistic accomplishments.